After reinventing Gmail with Google Inbox, Google is about to release a new invite-only service that will change the way you manage your mail. It's called Google Spam and it shows the most popular spam messages sent to Gmail users. That's right, Google Spam will go beyond your inbox and show what you've been missing all this time: the spam messages received by other people. To protect user privacy, Google Spam will only show messages received by at least 10,000 Gmail users. You'll be able to star your favorite spam messages, label them, forward them to your friends and even find their true meaning. Gmail will highlight important spam messages, so the next time you receive messages from "the office of the US Ambassador to Nigeria", "Mr. Lee Kun-hee of Samsung Group chief and the Hyundai chaebol" or from Gmail Security Maintenance, you'll know if they're featured in Google Spam. 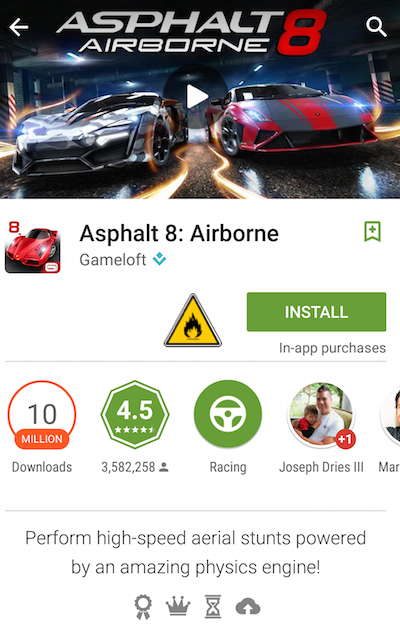 The latest version of the Google Play Store app brings a new feature for those who own a Snapdragon 810 phone. Many people complained about the overheating issues of Qualcomm's flagship SoC, so Google decided to add a fire warning icon next to the apps and games from the Play Store that require a lot of resources. The good news is that the new icon will only be added for HTC One M9 and other Snapdragon 810 devices, so those who use older phones and tablets won't see the warnings. Google even considers releasing a special version of Android optimized for Snapdragon 810, which disables advanced features like OpenGL and the new Android runtime (ART), so that the octa-core CPU doesn't overheat. It will be called "Lollipop Ice Cream", as it will try to cool down the latest Android devices, while also bringing back the features from Android Ice Cream Sandwich. April Fools' Day is here, so it's time to list all the pranks, hoaxes and funny Google features that make this day so special. 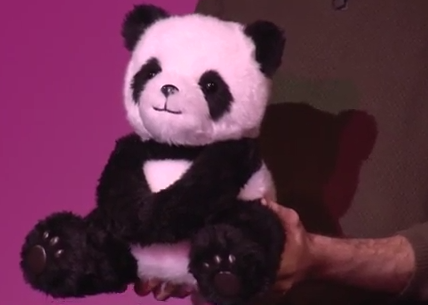 Google Japan announces Google Panda (translation), a cute toy that answers your questions using the power of Google Search. There's also a "keyless" keyboard for Japanese (translation). 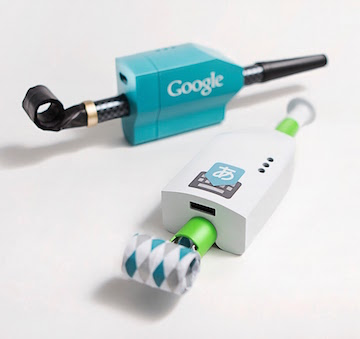 Piropiro uses a party horn and measures your breath to convert it into words. Google Maps lets you play Pac-Man. 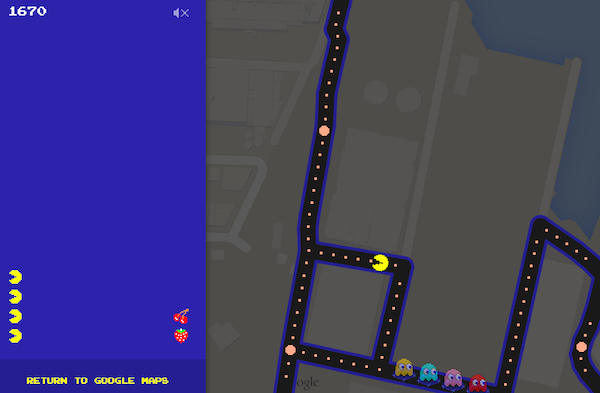 "Play the classic arcade game PAC-MAN in Google Maps with streets as your maze. Avoid Blinky, Pinky, Inky, (and Clyde!) as you swerve the streets of some famous places around the world." You can also play Pac-Man in the real word using Ingress, Google's augmented reality game. Google Australia found that Australia is at risk of becoming a Northern Hemisphere country by 2055. "Over the past two months, Google Maps engineers in Sydney have discovered that the Earth's equator is slipping south at rate of 25km per year — much faster than previously thought." Gmail launched Smartbox by Inbox, "a better, smarter mailbox that fuses physical mail with everything you love about the electronic kind". 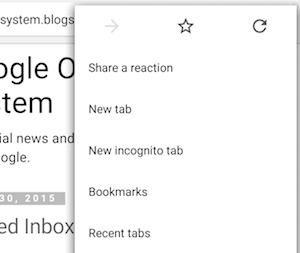 Chrome for mobile added a new feature that lets you share reactions about the pages you visit. 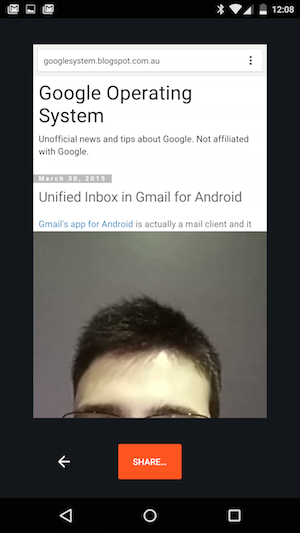 "With #ChromeSelfie you can share sites with your family and friends on social media and via instant messages, along with a handsome selfie instead of cumbersome text." 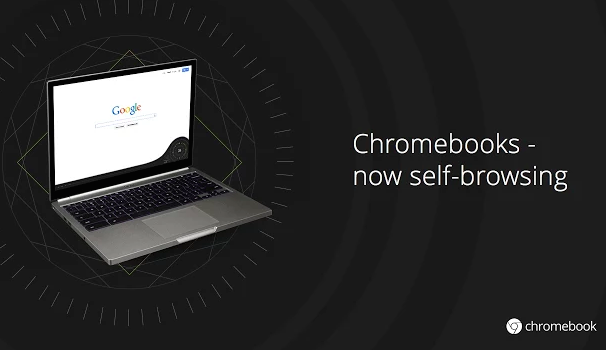 There's a self-browsing extension for Chromebooks. "With just one click, you're off surfing the web — no input needed. Just lean back, and we'll take you there - quickly, simply, and securely." The extension also writes emails automatically, sends roses to your significant other on Valentine's Day, buys and sells stocks and plans your vacations. "This new functionality has been tested for weeks, browsing the whole web from classifieds to news, music to cat photos - and now, these Chromebooks are responsible for the majority of ALL CAPS comments on the web," says François Beaufort. 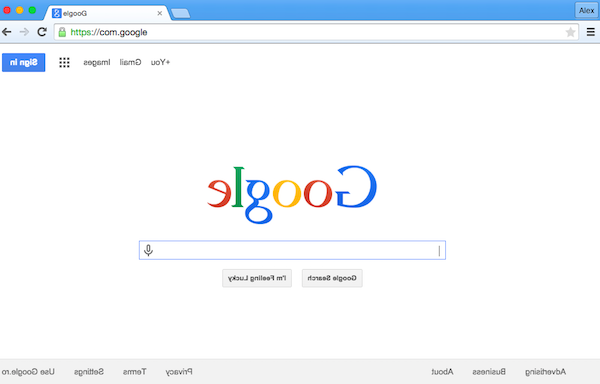 Google launched a new domain: com.google, which is just like google.com in the mirror. 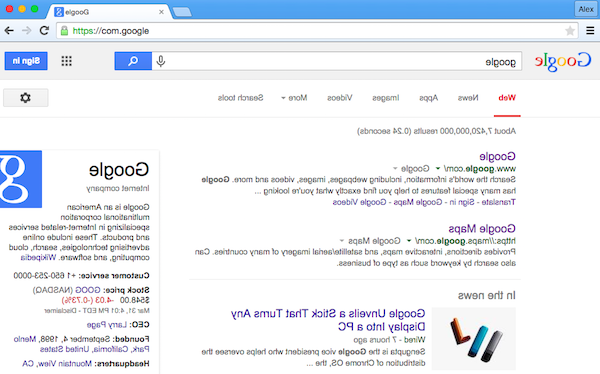 Similar to elgooG, the entire content of the page is flipped around. "We're always thinking about what's ahead, but sometimes it's important to look backwards. In that spirit, we're proud to introduce http://com.google, available today. Made possible by new gTLDs," informs Google. 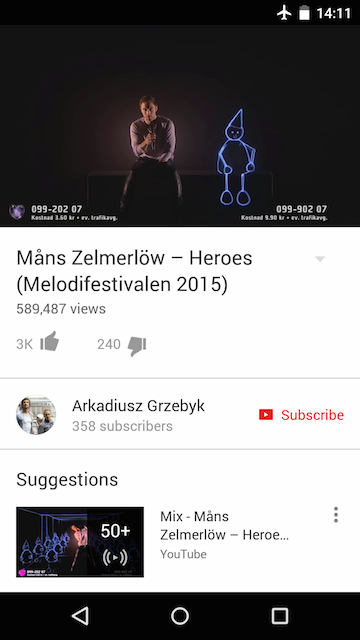 YouTube's player has a new button you can use to play some music. Just click "add music" and YouTube starts to play Darude's Sandstorm for a few seconds. Click again for more. 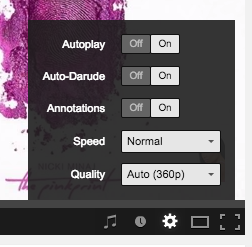 If you enable "Auto-Darude" in the settings, the AutoPlay feature will only play Sandstorm. 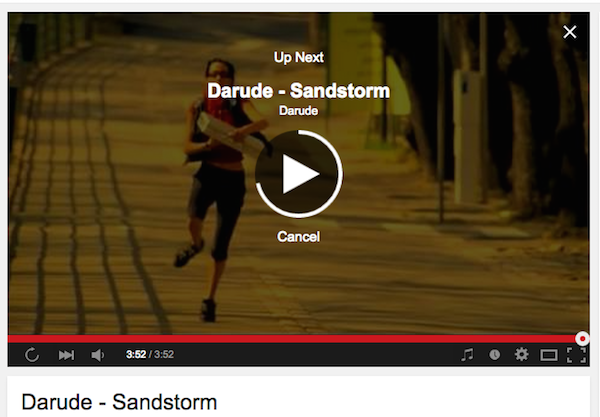 YouTube search results also include suggestions like this one: "Did you mean: Darude - Sandstorm by Darude". Google Fiber added the dial-up mode, just in case you want to go back in time. "As we've rolled out Google Fiber in Kansas City, Provo and Austin, we've learned that Fiber has been impacting our subscribers in ways that we didn't expect. Loading bars used to give people an opportunity to pause and take care of the little things — like making a cup of coffee, taking a bathroom break or playing with the dog. We've been told that Fiber’s seemingly instant connections have taken away that precious time." Google Italy made an experiment (translation): "50 gamers, comedians, designers, beauty experts and many others have exchanged their respective channels, working together to bring the spirit of April Fool's on YouTube." Google Actual Cloud Platform is "the world's first public cloud running on servers in the troposphere. Drawing on charges from electrical fields during thunderstorms, we're able to supercharge read/write performance on all persistent disks and offer 50% higher IOPS." 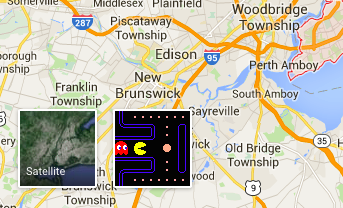 Google Maps has a cool Easter Egg for April Fools' Day: a Pac-Man mode. Just click the Pac-Man icon at the bottom of the Google Maps window if you're using a computer. You can also search for a place you think Pac-Man might be, especially if you use a mobile device. Google offers some hints like: "Chomp your way to independence down seven lanes of July" or "Previous PAC-MAN lives don't get to rest in a white marble mausoleum". 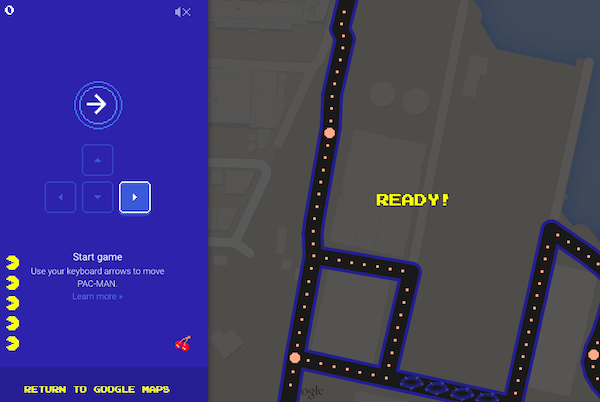 "You can now play the classic arcade game PAC-MAN in Google Maps with streets as your maze. Avoid Blinky, Pinky, Inky, (and Clyde!) as you swerve the streets of some famous places around the world. But eat the pac-dots fast, because this game will only be around for a little while," explains Google. 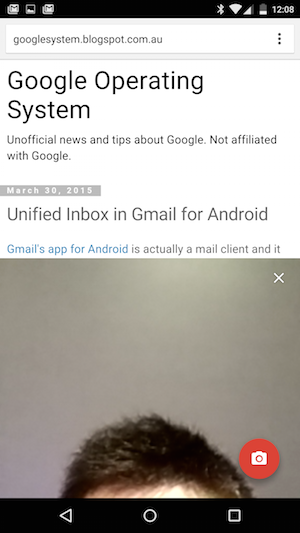 Angelo Giuffrida, a reader of this blog, noticed a new feature in Chrome for Android. 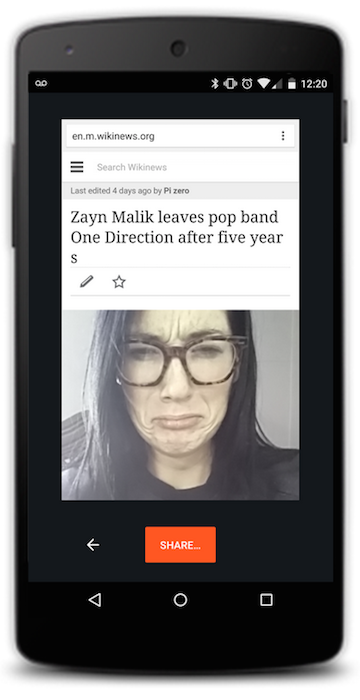 There's a new menu item that lets you "share a reaction". You're supposed to take a selfie, Chrome adds a screenshot of the page you were reading and then you can share the #ChromeSelfie with your friends. This looks like a special feature for April Fools' Day. In fact, you can enable this feature by changing the date of your Android phone or tablet to April 1st. Update: Chrome's blog announced the new feature. "With #ChromeSelfie you can share sites with your family and friends on social media and via instant messages, along with a handsome selfie instead of cumbersome text." 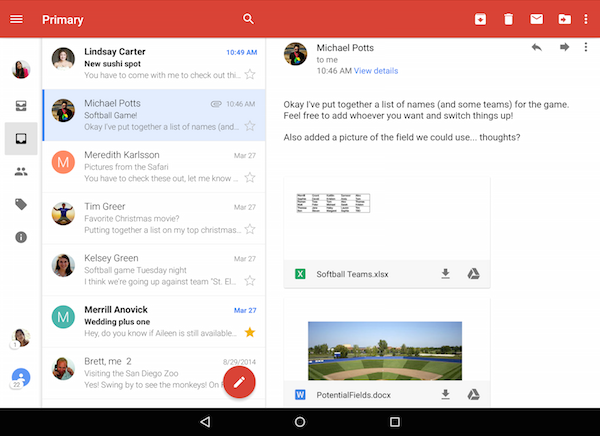 Gmail's app for Android is actually a mail client and it lets you add all your email accounts, including those from Yahoo Mail and Outlook.com. The main benefits of integrating the stock Email app are that it can now be updated faster and you only need to use a single app instead of two apps. 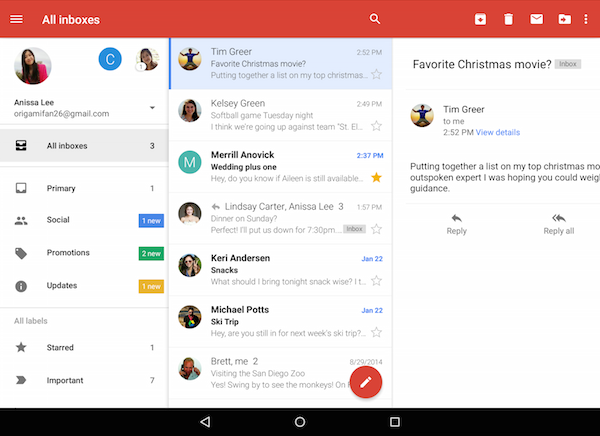 The latest version of the Gmail app for Android brings a lot of new features: unified inbox, conversation view for non-Gmail accounts, better search suggestions, larger attachment previews and more. The "all inboxes" section shows the messages from all your accounts, so you can quickly read them and write replies without having to switch between your accounts. Threaded conversations are no longer limited to Gmail accounts: conversation view is available for all your email accounts. "Today’s update also includes more responsive animations (like when you open and close a conversation), larger attachment previews to help you see what's inside, and the ability to save to Drive with a single tap," informs Google. If you're using the compression proxy from Chrome for Android or iOS and you'd like to see a similar feature in Chrome for desktop, there's a Chrome extension from Google that adds this feature. 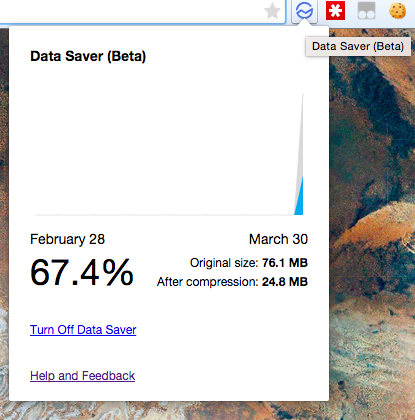 Data Saver is still in beta, but it works well and it's pretty useful: it reduces data usage by using Google servers to optimize the pages you visit. "When this extension is enabled, Chrome will use Google servers to compress pages you visit before downloading them. SSL and incognito pages will not be included," informs Google. It's nice to see that Google Web Accelerator is brought back to life. Even if Data Saver only works in Chrome and it doesn't have all the features from Google Web Accelerator, it's less controversial than Google's Labs project. For the past 4 years, Google+ was the place where you could find some of the most interesting and innovative Google features. From powerful photo editors to automatically enhanced photos and auto awesome effects, from video conferencing to live streaming, Google+ integrated and upgraded many standalone Google services. 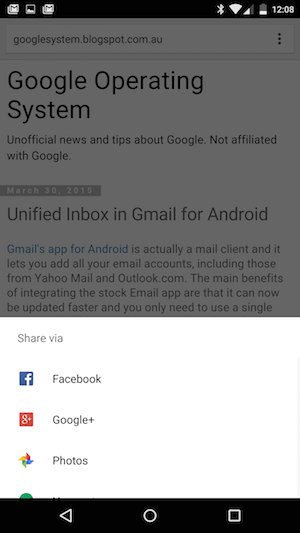 Google now wants to set free some of the Google+ features and make them available outside Google+. Google Drive now lets you browse the photos and videos uploaded to Google+ Photos. There's a new Google Photos section inside Google Drive and it's interesting to point out that the name is Google Photos and not Google+ Photos. 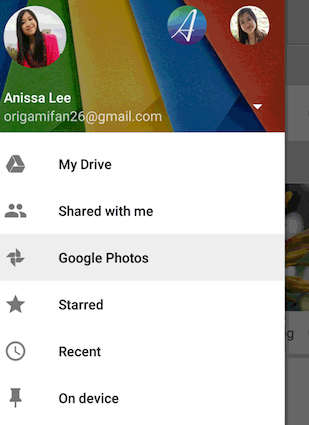 "To get started, just look for the new Photos menu in Drive for Android, iOS and the web. From there you'll be able to manage your photos and videos alongside other types of files. For example, you can now add pictures of wedding venues and cakes to the same Drive folder as your guest list and budget," suggests Google. You can add Google+ photos and videos to Google Drive folders, print, download, share, delete or rename them. The new feature is gradually rolled out in Google Drive for the web and the mobile apps, so you may not see it yet. Google Keep now lets you add labels to your notes. Just click the 3-dot icon below the note and select "add label". There are 3 default labels (inspiration, personal, work), but you can add your own labels. 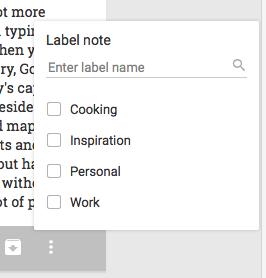 Google Keep's navigation menu shows your labels, so you can quickly find related notes. 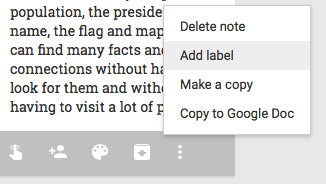 You can now export notes to Google Docs: just click "copy to Google Doc" and Google will create a document from your note. The new features are available in Google Keep's web app, Chrome app and Android app (Google Keep 3.1). Last month, Google tested some colorful cards for mobile search results. Now Google's mobile site shows Knowledge Graph cards with colorful backgrounds, but only if you're not signed in. It's not clear if Google uses random colors or they're related to the image search results. As previously anticipated, YouTube's autoplay feature is no longer an experiment and it's now a regular feature enabled by default. 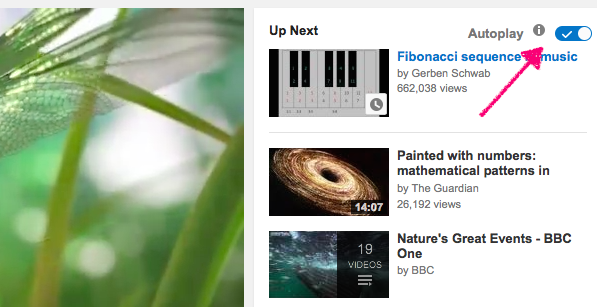 YouTube automatically plays related videos until you pause videos or you disable autoplay. 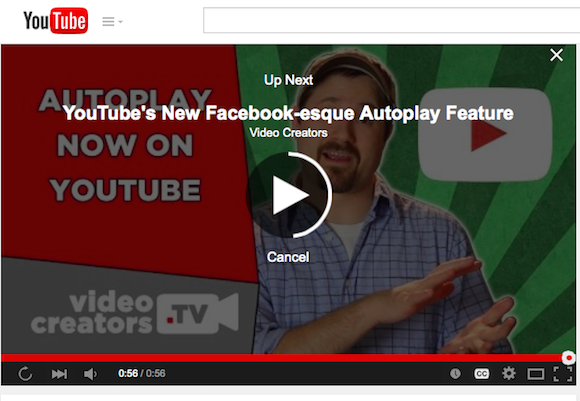 "When autoplay is enabled, a suggested video will automatically play next," explains Google. You can disable autoplay by unchecking "autoplay" in the right sidebar or in the player's settings menu. YouTube saves the setting in a cookie, so it will no longer play related videos automatically until you enable the feature again or clear YouTube cookies. "Once a video is over, you'll see a 10 second countdown that tells you what's going to play next. The next video that plays is determined by your viewing history. If you want more time before the next video starts, pause the countdown by scrolling down past the video player. You can also pause the countdown by typing, either a comment or something into the search box. Also, you can click 'Cancel' on the countdown screen to stop the next video from playing." Google's suggestions are sometimes surprising, weird, funny. Google tries to guess what you are about to type and uses other people's searches to autocomplete your query. "Apart from the Google+ profiles that may appear, all of the predictions that are shown in the drop-down list have been typed before by Google users or appear on the web," informs Google. Have you ever tried to anticipate Google's suggestions? Google Feud is a simple game based on Family Feud that shows the first part of a query and asks you to guess how Google autocompletes it. 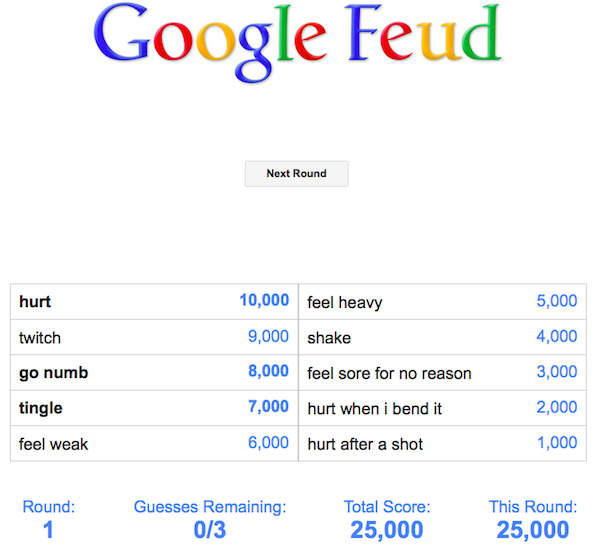 "Google Feud is a web game based on the Google API. We select the questions, then the results are pulled directly from Google's autocomplete," informs the site, which is not affiliated with Google. 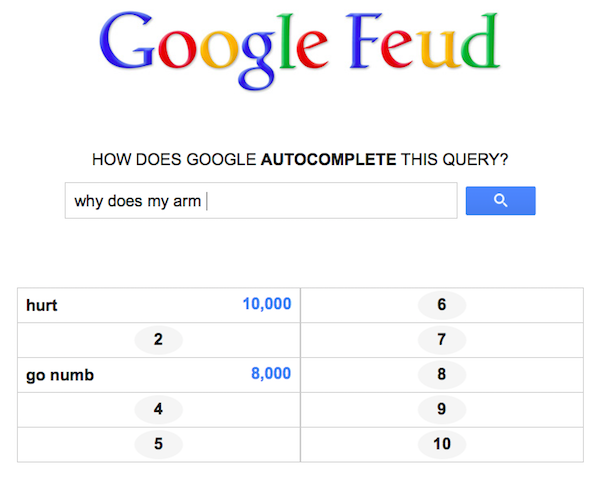 Google Feud uses the top 10 suggestions for a query. You can get more points if you guess a suggestion that is more popular and you can only make 3 mistakes. There are 4 categories of queries: culture, people, names, questions. 1. 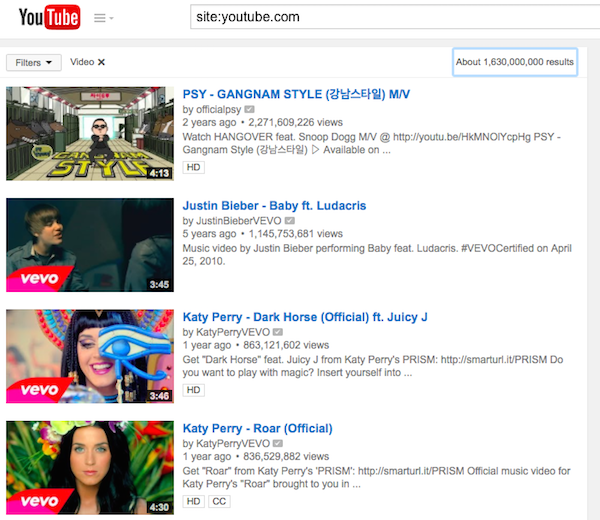 Most viewed videos of all time. Use these filters from the dropdown: type:video, sort by: view count. To add a filter, click the Filters dropdown and select one of the filters from the 5 columns. You can add multiple filters, but you can only pick a single filter from a column. To remove a filter, click the "x" next to the filter. There's also an option that lets you "clear all filters". 2. Most viewed videos uploaded in the past 30 days. 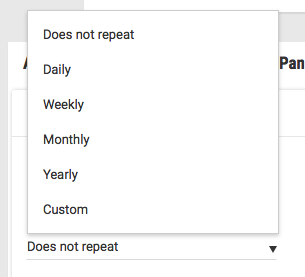 Use these filters: type:video, upload date: this month, sort by: view count. 3. Most viewed videos uploaded in the past 12 months. Use these filters: type:video, upload date: this year, sort by: view count. 4. Most viewed videos uploaded in the past 24 hours. Use these filters: type:video, upload date: today, sort by: view count. 5. Most viewed HD videos of all time. Use these filters: type:video, features: HD, sort by: view count. 6. Most viewed 4K videos of all time. Use these filters: type:video, features: 4K, sort by: view count. 7. Most viewed 3D videos of all time. Use these filters: type:video, features: 3D, sort by: view count. 8. Most viewed playlist. Use these filters: type:playlist, sort by: view count. 9. Random videos with no dislikes. Enable these filters: type:video, sort by: rating. 10. Random popular videos. Enable these filters: type:video, sort by: relevance. 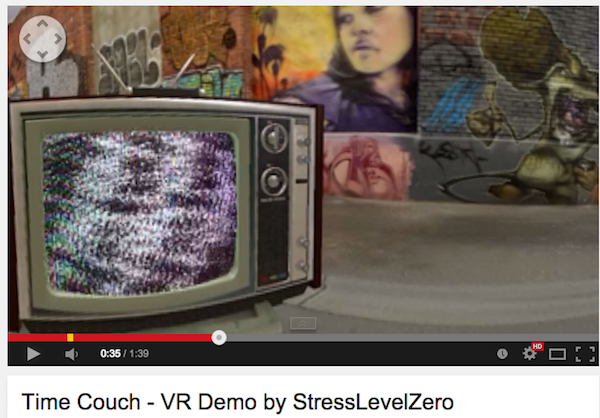 YouTube added support for 360-degree spherical videos and they're impressive. "You could let viewers see the stage and the crowd of your concert, the sky and the ground as you wingsuit glide, or you could even have a choose-your-own-adventure video where people see a different story depending on where they look," suggests YouTube. For now, 360-degree YouTube videos are only fully supported in Chrome for desktop and the YouTube app for Android. In Chrome you can use your mouse to drag the point of view, while in the Android app you can move your device around or manually change the point of view. If you watch these videos in other browsers or apps, you can see the entire panoramic images. If you want to upload your own photosphere-like panoramic videos, there's a help center article that offers more information. YouTube supports 5 cameras: Bublcam, Giroptic 360cam, IC Real Tech Allie, Kodak SP360, Ricoh Theta. For now, you need to run a script to insert metadata, but YouTube will try to make it easier to upload videos in the future. 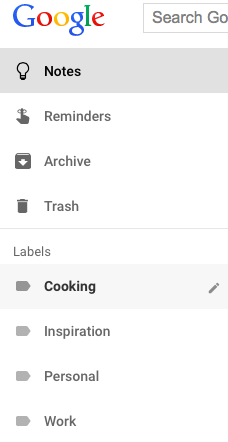 Google Drive has recently changed the name of the "Incoming" section, which is now called "Shared with me", just like in the old Google Drive interface. "With the launch of the new Drive UI last year, we renamed the 'Shared with me' section to 'Incoming' and tweaked the functionality a bit. We've since heard feedback from people using the new UI that they miss the 'Shared with me' functionality, so today, we're bringing it back," informs Google. "Incoming" was shorter, but "shared with me" is easier to understand. It's more obvious that the section includes the files and folders that other people have shared with you. 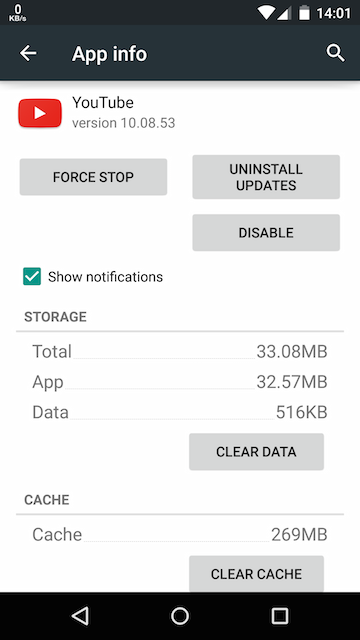 I noticed that my Nexus 5 uses a lot of storage for cache and I wanted to see which Android app caches so much data. It turns out that YouTube used 269MB for cache. I didn't use YouTube's offline feature for music videos, so it seemed strange to see that YouTube suddenly caches a lot of data. It turns out that YouTube's mobile app for Android now caches the videos you watch. If you watch a video again, YouTube no longer has to download the same chunked files: it uses the cache. After watching a video, I switched to the airplane mode and I could play the video offline, even if it's not supported by YouTube Music Key. 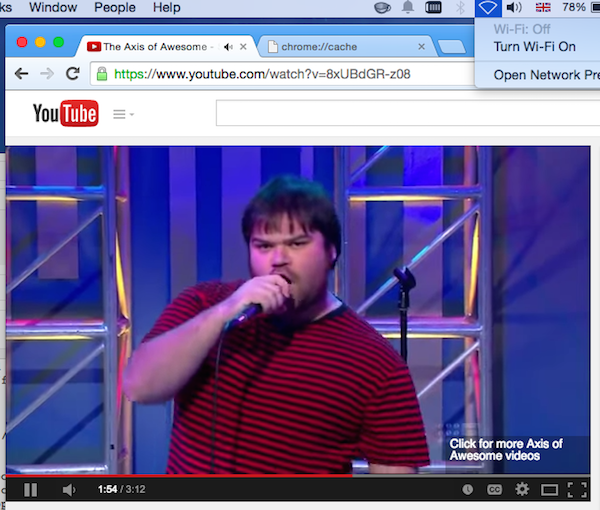 Even YouTube's desktop site started to cache videos again. Since switching to adaptive streams (DASH) in the HTML5 player, YouTube downloaded videos every time you watched them, wasting a lot of bandwidth. 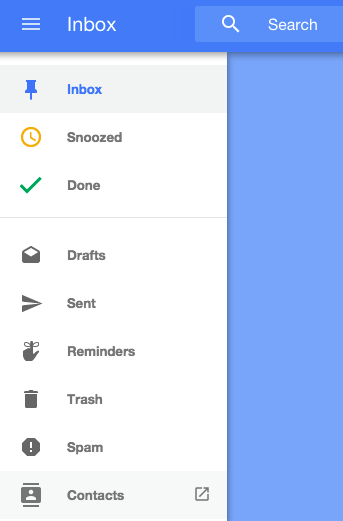 When Google Inbox launched, many people wondered why it doesn't have a contact manager. Now that Google Contacts has a new preview version powered by Material Design, Google Inbox's desktop site added a Contacts link to the sidebar. It only opens Google Contacts in a new tab, but it's still useful. Two years after introducing Chromebook Pixel, Google announces a hardware refresh. The new Chromebook Pixel is less expensive, more powerful and still cutting edge. Google preserved what made the first Chromebook Pixel stand out: the high-resolution 12.85" IPS display with 3:2 aspect ratio, multi-touch and 400 nit brightness, the aluminum body and glass trackpad. 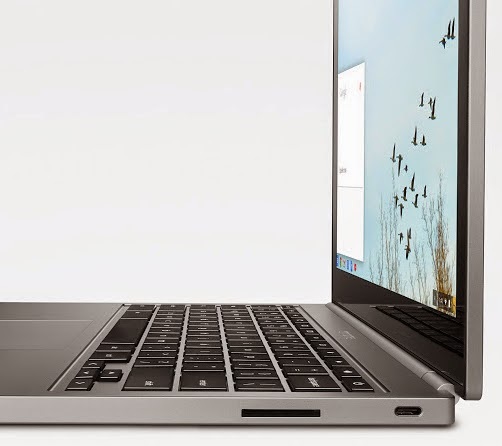 The new Chromebook Pixel has Intel Broadwell dual-core CPUs (i5 5200U/i7 5500U), 8 or 16GB of RAM (depending on the version), 2 USB 3.0 Type-C ports that are also used for charging and external displays, 2 additional USB 3.0 standard ports, WiFi ac, Bluetooth 4.0, a new wide-angle camera lens and up to 12 hours of battery life. Other improvements: Pixel is now thinner and a little bit lighter (15.2 mm and 1.5 kg, down from 16.2 mm and 1.52 kg). 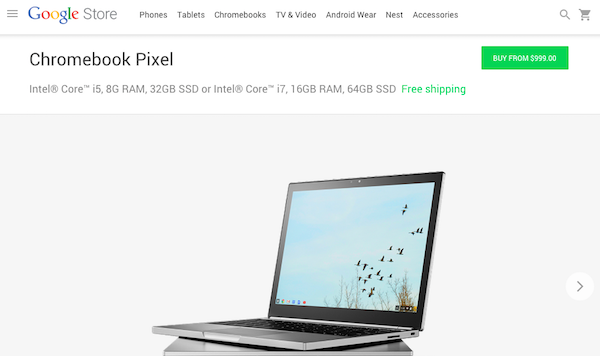 There are two Chromebook Pixel versions: the first one costs $999 (i5 Intel CPU/8GB RAM/32GB SSD) and the second one is called LS - "Ludicrous Speed" and costs $1299 (i7 Intel CPU/16GB RAM/64GB SSD), much like the original Pixel. Both versions are available in the new Google Store and you can only buy them if you're in the US. Google no longer offers an LTE version. "For the new Pixel, we've joined forces with some of the biggest names in the industry to create a new standard for charging, called USB Type C. The Pixel is one of the first products to launch with this new standard, with more Chromebooks and Android devices following suit soon. Not only does Type-C enable multi-device charging, but it also allows high-speed data and display over the same connector and cable. It's small enough to work with smartphones, powerful enough to charge computers, and conveniently symmetrical (no more guessing which side is up! )," explains Google. 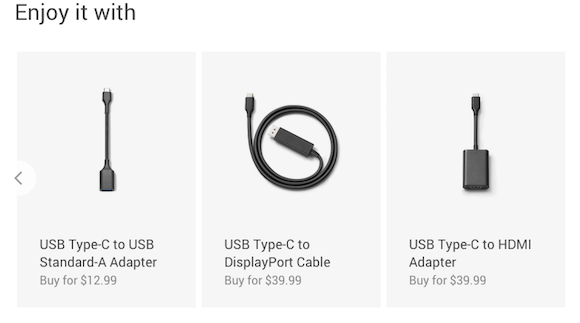 There are some optional adaptors and cables in the Google Store: USB Type-C to Standard-A adapter ($12.99), USB Type-C to DisplayPort cable ($39.99), USB Type-C to HDMI adapter ($39.99). Apple's latest Macbook also uses USB Type-C, but it has a single port, it's thinner and lighter. Apple opted for a fanless design and used ultra low-power Core M CPUs, which are less powerful than the ULT CPUs from Chromebook Pixel and Macbook Air. High-end Chromebooks won't sell that well, but Google has a high-quality laptop that can be used by its own employees and other early adopters. It's also a reference device for Chromebook OEMs. 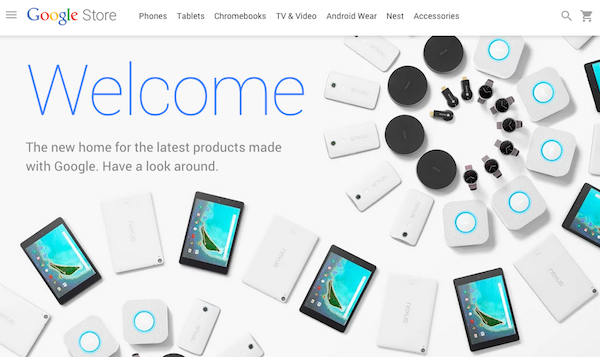 The Devices section from Google Play has moved to the new Google Store, "the new home for the latest products made with Google". You can buy Nexus phones and tablets, Chromebooks, Android Wear smartwatches, Chromecast and Nexus Player, Nest Thermostat and Nest Protect and a lot of accessories for Google products, including Google Glass. "Need a hardware device? Think the Google Store. Need digital content to enjoy on your device? Think Google Play," explains Google. 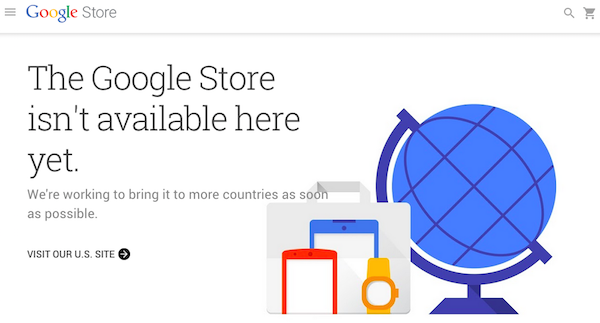 You can sign up for the Google Store newsletter to find the latest offers and updates. "The Google Store is available on your phone, tablet, or laptop, and right now you'll get free shipping on everything (consider it our way of saying hello)," says Google. Here's the error message that's displayed if Google Store is not available for you: "The Google Store isn't available here yet. We're working to bring it to more countries as soon as possible." Why would Google move the hardware section from Google Play? I think there are many reasons: Google now sells a lot of hardware products and not all of them have something to do with Android, the Devices section wasn't even included in the Google Play Store app for Android. Another reason could be that Google plans to have its own offline stores and maybe release mobile apps for Google Store. Search Engine Land reports that Google made it more difficult for non-US users to switch from their local Google site to Google.com. 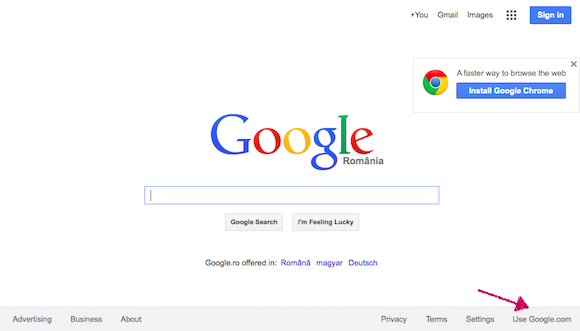 Until now, you could switch to Google.com by clicking "use Google.com" at the bottom of the homepage. Google made a change and it now shows the "use Google.com" link only when you're redirected from Google.com to your country's Google site. This way, most people will no longer see the "use Google.com" link. One workaround is to visit Google.com to see the link. Another option is to go to www.google.com/ncr, the same URL that used to the displayed by Google. "NCR" means "no country redirection", so the URL can be used to bypass Google's redirection. Why would Google hide the link? Danny Sullivan suggests that the latest change could have something to do with the "Right To Be Forgotten" feature. "Google’s come under increasing pressure from both Canada and the EU to censor its results on Google.com in addition to censorship demands on country-specific versions." I use Google.com because it has the latest features and it's more up-to-date.